The VBSN Battle Buddy Mentor system has been implemented to encourage active engagement among VBSN students. Davenport University wants all VBSN students to feel supported to acclimate, adapt, and thrive. The transition from military life to a civilian career can be daunting, so a mentor could show a new VBSN student the ropes and answer the questions critical to their success. 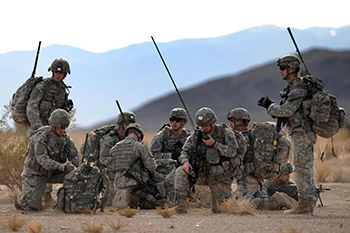 Why do you want to be a Battle Buddy? This project was supported 2013-2019 by the Health Resources and Services Administration (HRSA) of the U.S. Department of Health and Human Services (HHS) under grant number UF1HP26488 and title "Veterans to BSN Program" for $1,527,068, with 0% financed with nongovernmental sources. This information or content and conclusions are those of the author and should not be construed as the official position or policy of, nor should any endorsements be inferred by HRSA, HHS or the U.S. Government.